↑ Pin, Pierre A.; Zhang, Wenying; Vogt, Sebastian H.; Dally, Nadine; Büttner, Bianca; Schulze-Buxloh, Gretel; Jelly, Noémie S.; Chia, Tansy Y. P.; Mutasa-Göttgens, Effie S. (2012-06-19). 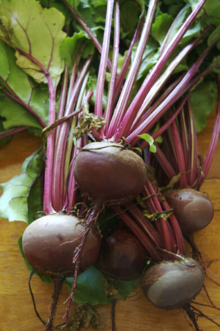 "The Role of a Pseudo-Response Regulator Gene in Life Cycle Adaptation and Domestication of Beet". Current Biology (अंग्रेज़ी में). 22 (12): 1095–1101. PMID 22608508. आइ॰एस॰एस॰एन॰ 0960-9822. डीओआइ:10.1016/j.cub.2012.04.007.